Danish Army Specific: Used by regimental commanders from the late 1960´s. Acquisition price in 1973 was around 36.000,- DKr. Historical: The Volvo 164, a genuinely luxurious model based on the Volvo 144, was introduced in autumn 1968. It was designed by Volvo designer Jan Wilsgaard. As Volvos first six-cylinder model for many years, the car was equipped initially with a carburettor and developed 130 hp. Later, it was equipped with fuel injection (164E) and the engine was uprated to 175 hp. Only offered as a 4 door saloon (or sedan), the 164 nonetheless shared many components with its 144 sister. From the windshield rearward, sheetmetal was identical. The front was lengthened 6 inches to accommodate the longer 6 cylinder engine. 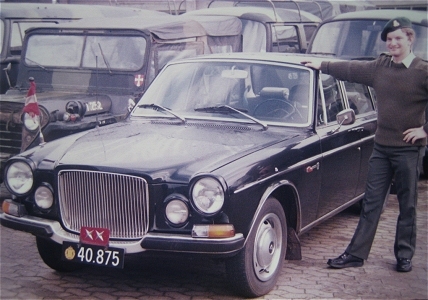 In 1972 the 164 had a small face lift with a straight, narrow front bumper and a smaller front grill, and in 1973 the dashboard was changed to that of the 240 which was introduced in 1973. Metallic paint was also provided in 1973. When the production seized in in 1975 more than 155.000 vehicles had been made. Length: 4.70 m (183 inches). Height: 1.44 m (56 inches). Engine: Own 6-cylinder, type B30, 2.978 cm3 (182 cubic inches), liquid cooled. Horsepower: 130 at 5.000 rpm..
Additional: Some vehicles had electric overdrive, and some a 3-speed automatic gearbox. Leather upholstery and sunroof could be specified.